They're back...They're Hungry...And they're NOT vegetarian. Among the entries in the zombie franchise, 1985’s Return of the Living Dead ends up in an unusual place. 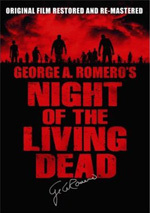 Ever since 1968’s Night of the Living Dead, director George Romero has maintained public ownership of the series. 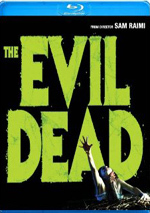 He’s produced four sequels to date and remains tightly associated with the Living Dead brand. Return appeared to win that fight, at least in 1985. It made more money, and I think it got better reviews. I’m going on 25-year-old memories here, but I believe its brand of horror comedy earned pretty positive notices. While I’m not sure about that, I am positive that I thought Day was awful, so there was almost no way I wouldn’t prefer Return. In this sequel, veteran medical supplies employee Frank (James Karen) shows new hire Freddy (Thom Mathews) around the shop. Along the way, they accidentally bust a canister with some dangerous gas developed by the military. Problem solved, right? Nope. This simply allows for the gas to rise through the oven’s chimney and spread through rainclouds. When a storm drenches the area, the toxins cover a nearby cemetery and bring plenty of brain-hungry zombies out of the ground. To say the least, this causes mayhem. 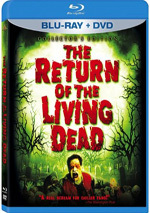 Return of the Living Dead appears in an aspect ratio of approximately 1.85:1 on this Blu-Ray Disc. Given the low-budget nature of the film, the source suffered from inherent drawbacks. Still, the Blu-ray appeared to replicate the original flick in an acceptable manner. The biggest concern on display related to sharpness. While most of the movie provided acceptable to good clarity, more than a few exceptions occurred, especially in wider shots; those could appear downright soft at times. These did seem to stem from the original photography, though, so I couldn’t fault the transfer. I witnessed no issues with jagged edges or moiré effects, and no signs of edge enhancement occurred. I didn’t sense the use of digital noise reduction, as the flick featured ample – but natural – grain, and source flaws weren’t a factor. A speck or two cropped up, but nothing more than that. Colors were decent to good. Much of the film took place in murky nighttime settings, and that diminished the impact of the hues. During brighter scenes, however, the tones tended to work pretty well; though they occasionally were a bit messy, they could be pretty solid. Blacks seemed okay, with decent depth, but they weren’t better than average. Shadows showed the same issues; low-light shots tended to appear somewhat muddy. Again, these issues related to the source material, not the transfer. I felt the image deserved a “C+“. 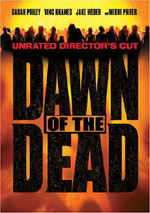 In addition to the film’s 1985 monaural soundtrack, the Blu-ray boasted a DTS-HD MA 5.1 remix. Don’t expect the latter to reinvent the wheel, however, as it often remained essentially monaural. On the positive side, the rain that poured during significant sections of the movie spread across the front and rear well. That element managed to open up the environment in a pleasing manner. Quite a few extras flesh out this set. We find two separate audio commentaries, the first of which comes from director Dan O’Bannon and production designer William Stout. Both sit together for this running, screen-specific look at cast and performances, sets, locations and production design, cinematography, effects, and makeup. With Stout in tow, some inevitable repetition occurs. Nonetheless, the others help makes things fresh and fun. They throw in interesting perspectives, and some zombies even show up for a while to deliver comic relief. While never a great commentary, this track manages to become likeable and informative. The movie boasts two quirky subtitle features. A basic “Zombie” option simply gives us text for what the zombies say during the film. On the other hand, In Their Own Words: The Zombies Speak offers the same material along with comic “explanations” of their thoughts and moans. These aren’t the most amusing lines I’ve seen, but they offer a witty way to watch the film. Three featurettes ensue. The Dead Have Risen goes for 20 minutes, 34 seconds and includes notes from Calfa, Peck, Randolph, Quigley, Trautman and actors Clu Gulager, James Karen, and Thom Mathews. “Risen” looks at rehearsal and shooting schedule, cast and performances, and various notes from the production. Some of the material repeats from the commentaries, but the presence of additional actors makes it a good exploration of the issues they faced. The Decade of Darkness lasts 23 minutes, 23 seconds and features Trautman, Horror Films of the 1980s author John Kenneth Muir, Dolls director Stuart Gordon, The Howling director Joe Dante, “Mistress of the Dark” Elvira, American Werewolf in London director John Landis, Fangoria editor Tony Timpone, actors Dee Wallace, Catherine Hicks and Bill Mosely, and Child’s Play director Tom Holland. “Decade” examines horror trends during the 1980s. It’s not the most coherent piece – it tends to flop from one area to another without much logic – but it offers some interesting thoughts about the era’s scary flicks. Finally, Designing the Dead runs 13 minutes, 38 seconds and offers remarks from O’Bannon and Stout. We look at O’Bannon’s path to the director’s chair and the film’s development, script issues, and production and monster design. Despite a bit of inevitable repetition from elsewhere, the info usually seems fresh and compelling. This package also boasts a Bonus DVD. The disc offers the 2007 Collector’s Edition, which was a pleasant surprise. With Blu-rays like Escape from New York and Invasion of the Body Snatchers, we found inferior older DVDs, not more recent editions. It’s nice that Return takes the high road and provides the best DVD version available. No one will mistake Return of the Living Dead for the genre’s best, but that doesn’t make it a bad entry. The movie mixes comedy and horror in a satisfying way. The Blu-ray gives us acceptable picture and audio along with a nice set of supplements. Fans should enjoy this good release.